Dr Muhammad Iqbal completed his PhD in Learning Classifier Systems (LCS) under the supervision of A/Prof Will Browne and Prof Mengjie Zhang, in the Evolutionary Computation Research Group (ECRG), at the School of Engineering and Computer Science, Victoria University of Wellington (VUW), New Zealand. He is currently working as a postdoctoral research fellow at VUW. 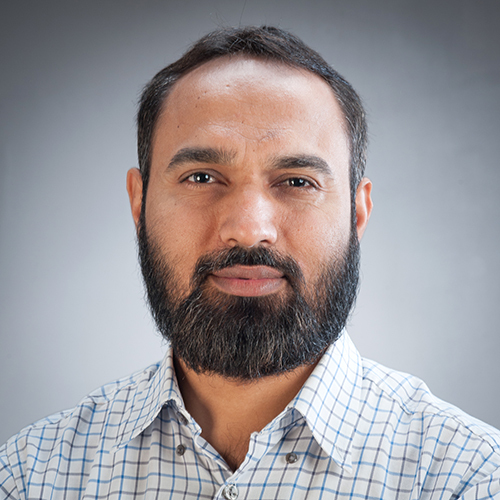 Iqbal's main research interests are in the area of evolutionary machine learning. His research focuses on evolutionary image analysis and classification using transfer learning in genetic programming and learning classifier systems techniques. He is also interested in medical image analysis, data mining, and scalability of evolutionary techniques. M. Iqbal, S. S. Naqvi, W. N. Browne, C. Hollitt, and M. Zhang, "Learning Feature Fusion Strategies for Various Image Types to Detect Salient Objects," Pattern Recognition, 60 (2016) 106–120. M. Iqbal, B. Xue, and M. Zhang, "Improving Classification on Images by Extracting and Transferring Knowledge in Genetic Programming," the IEEE Congress on Evolutionary Computation, accepted, 2016. F. B. Claridge, M. Iqbal, and M. Zhang, "Mammographic Image Analysis using Genetic Programming," the IEEE Congress on Evolutionary Computation, accepted, 2016. Y Liu, M. Iqbal, I Alvarez, and W. N. Browne, "Integration of Code-Fragment based Learning Classifier Systems for Multiple Domain Perception and Learning," the IEEE Congress on Evolutionary Computation, accepted, 2016. A. B. Siddique, M. Iqbal, and W. N. Browne, "A Comprehensive Strategy for Mammography Image Classification using Learning Classifier Systems," the IEEE Congress on Evolutionary Computation, accepted, 2016. M. Iqbal, B. Xue, and M. Zhang, "Reusing Extracted Knowledge in Genetic Programming to Solve Complex Texture Image Classification Problems," in Proceedings of the Pacific-Asia Conference on Knowledge Discovery and Data Mining, 2016: 117-129. M. Iqbal, W. N. Browne, M. Zhang: Extending XCS with Cyclic Graphs for Scalability on Complex Boolean Problems. Evolutionary Computation, doi:10.1162/EVCO_a_00167, (2015). M. Iqbal, W. N. Browne, M. Zhang: Improving genetic search in XCS-based classifier systems through understanding the evolvability of classifier rules. Soft Comput. 19(7): 1863-1880 (2015). T. Kovacs, M. Iqbal, K. Shafi, and R. J. Urbanowicz: Special Issue on the 20th Anniversary of XCS. Evolutionary Intelligence. 8(2-3): 51–53 (2015). M. Iqbal, W. N. Browne, M. Zhang: Reusing Building Blocks of Extracted Knowledge to Solve Complex, Large-Scale Boolean Problems. IEEE Trans. Evolutionary Computation 18(4): 465-480 (2014). M. Iqbal, S. S. Naqvi, W. N. Browne, C. Hollitt, M. Zhang: Salient object detection using learning classifier systems that compute action mappings. GECCO 2014: 525-532 (Best Paper Award -- EML Track). M. Iqbal, W. N. Browne, M. Zhang: Learning complex, overlapping and niche imbalance Boolean problems using XCS-based classifier systems. Evolutionary Intelligence 6(2): 73-91 (2013). M. Iqbal, W. N. Browne, M. Zhang: Evolving optimum populations with XCS classifier systems - XCS with code fragmented action. Soft Comput. 17(3): 503-518 (2013). K. Shafi, R. J. Urbanowicz, M. Iqbal: Special Issue on Advances in Learning Classifier Systems. Evolutionary Intelligence. 6(2): 55–56 (2013). M. Iqbal, W. N. Browne, M. Zhang: Extending learning classifier system with cyclic graphs for scalability on complex, large-scale boolean problems. GECCO 2013: 1045-1052 (Best Paper Award --- GBML Track). M. Iqbal, W. N. Browne, M. Zhang: XCSR with Computed Continuous Action. Australasian Conference on Artificial Intelligence 2012: 350-361. M. Sarfraz, J.U Arshed, S. A. Madani and M. Iqbal: Object Recognition using Simulated Evolution on Fourier Descriptors. Soft Computing in Industrial Applications 75:205–213, 2010. M. Sarfraz, Mehmood-ul-Hassan and M. Iqbal: Object Recognition using Fourier Descriptors and Genetic Algorithm. International Conference of Soft Computing and Pattern Recognition 2009: 318–323.